And you know what? Bravo to WB for making the brave choice in its spinoff decisions. They could have gone the easier route, spotlighting the more family friendly Fishermen Kingdom, filled with its stately philosopher poets. They could have chosen Xebel, since we’ve already seen their king, Nereus (Dolph Lundgren), who is more or less a humanoid being and therefore basically relatable. But no. The studio opted to highlight the anglerfish-like beasts of the Trench, which seemed to have no discernible culture, society, or relational hierarchy when we saw them swarming around our heroes, Arthur Curry (Jason Momoa) and Meara (Amber Heard), as they swam for safety in the Hidden Sea. But who are we to judge the Trench dwellers from such a superficial look? Let us hear more of their story, which is currently being worked on by screenwriters Noah Gardner and Aidan Fitzgerald. 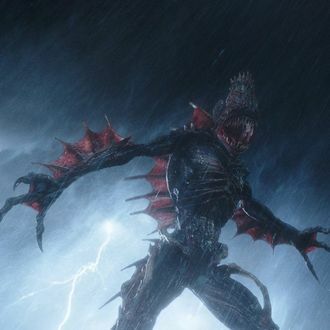 The main cast of Aquaman is said not to be involved with the movie, tentatively titled The Trench, but it will be produced by Aqua director James Wan, and is said to have a “horror-tinged” tone. Now make it the rock opera we deserve!